Superheroes are more popular than ever. The Marvel and DC movies have grossed billions at the box office, Comic-Con sells out every year and you’ll struggle to find anyone who can’t name at least 3 of the Avengers. But who is the most popular superhero in the US? We used Google Search Data to find out! And the winner is… Spider-Man, with seven states! Peter Parker is most popular in Florida, Tennessee, South Carolina, Alabama, Arkansas, Mississippi and his home state of New York. Batman swoops in at second, topping searches in Texas, New Mexico, Colorado, Wyoming, West Virginia and New Hampshire. In joint third place are Wonder Woman, Deadpool and The Flash. 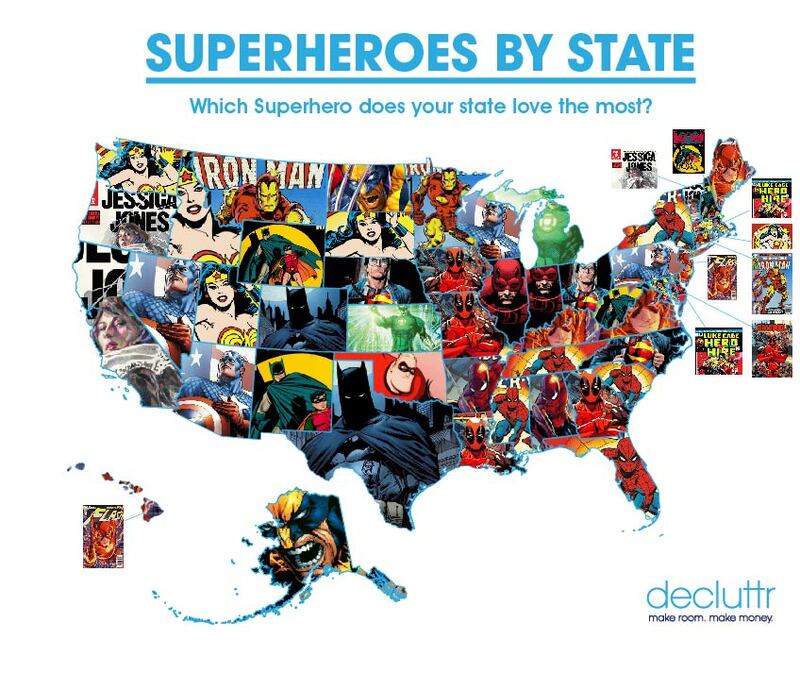 Wonder Woman is the most popular superhero in Washington, Rhode Island, Utah, Idaho and South Dakota; Deadpool’s unorthodox style is most popular in Iowa, Georgia, Delaware, Missouri and Louisiana; and the Flash is most popular in New Jersey, Maine, Kentucky, Virginia and Hawaii. Female superheroes rule the West Coast, with Jessica Jones winning Oregon and California (as well as Vermont) along with Wonder Woman’s West Coast states. There’s disappointment for Superman, who only took Ohio, North Carolina and Nebraska and lost his home state of Kansas to Green Lantern. Meanwhile, Iron Man – generally seen as one of the most popular Avengers – only came out on top in Minnesota, Montana and Connecticut. And spare a thought for Captain America; he was only most popular in four states, Pennsylvania, Nevada, Arizona and Wisconsin. So much for being America’s superhero! If you’re planning a clear out or need some extra CASH, sell your DVDs and Blu-Rays with Decluttr! Just get an instant price, ship your stuff for FREE and we’ll pay you the day after it arrives. No problem, we’ll buy them too! As well as DVDs, you can sell your iPhone, cell phones, games consoles, tablets, CDs, video games and books too! ← Which rom-com does your state love most?